In My adventures of creating my home lab that's a tiny version of AWS so I can spin up several VMS into a small cluster to experiment with some of the big data tools out there and give them a metaphorical kicking to see what they can do and if the be useful for me. In the previous post a created a small script that does the boiler plate work of setting up a vm. Since I am using cloud images I also does the basic OS setup and user creation. Now should be the fun bit connect to the vm but one problem what IP is it on? I have a mac address and nothing else. If its on the internal network which is handled by virsh then I can grep on virsh net-dhcp-leases --network default to find out the IP. But for br0 the only place it is listed is in the DHCP logs of the router but I don't want to log in to it each time I need to find an IP address. for experiments a grep on apr table was too inconsistent. More annoyingly since they are cloud images I cant log into them via VNC since only ssh with a private is the only way, Great !. Time to bring out the trusty hammer approach and machine gun the network by firing out a load of ping packets and wait for the apr table to update itself, I could just wait but who has time for that. Below is the final part in the vm-creation script that after the vm is started I search for the mac address in the apr table and if its not there query the network to see if the host is up. echo "Giving time for the network to stabilise"
echo "Host: $HOST | mac: $macadd | IP: $HOST_IP"
As you could probably imaging trying to get the network to report back the IP I created a few VMS sadly with not that interesting names I was getting a little fustrated my bash skills a a bit basic. 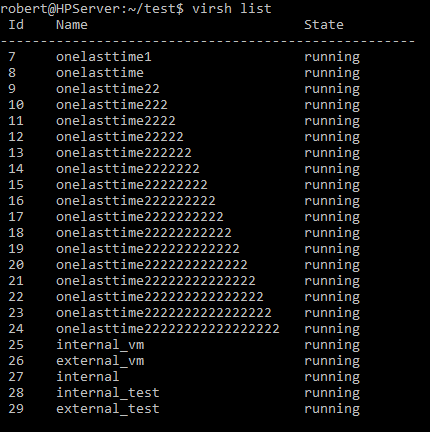 When the scripts were done I wanted a nice way in virsh to stop all active vms and delete them. Strangely Virsh did not have such a command or there was not a clever one-liner command I could find searching Google. No matter my tool box contains many hammers time to break out a sledge hammer. echo "Clean up in progress !" echo "Shutting down all vm !" echo "Now removing them !"